Elevation Gain: about 800 vertical feet. Time: It takes most folks about 2 hours to get to the lines and another hour on the lines. 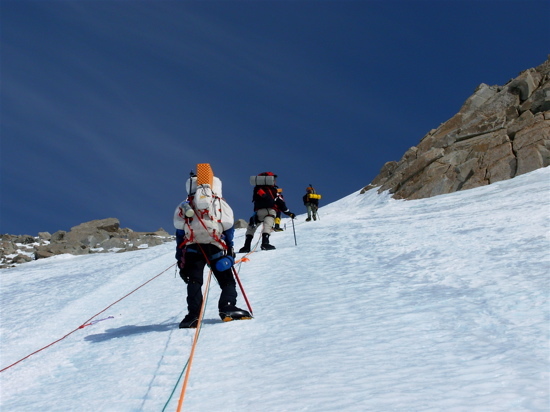 From 14 Camp, climbers ascend and gentle apron of snow that eventually steepens at a section called the Headwall. 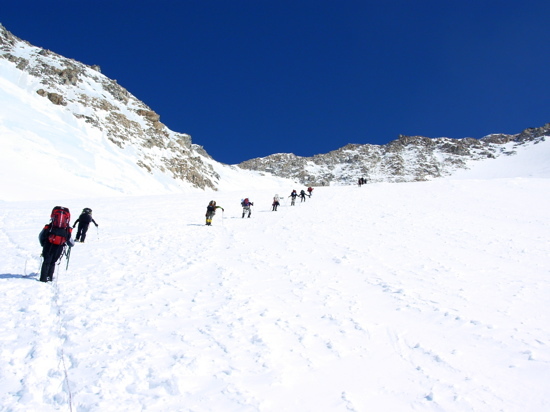 The Headwall spans the last 800 vertical feet to the crest of the ridge that leads to high camp at 17,220 feet. 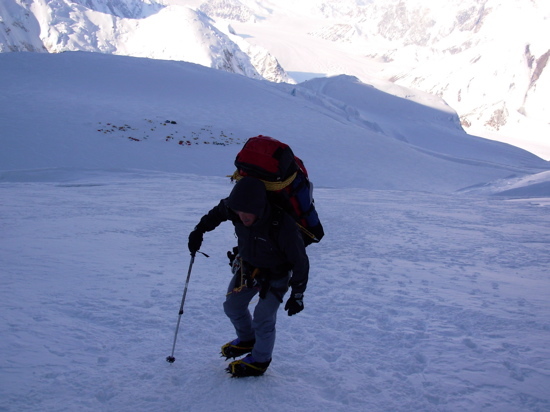 The angle and condition of the snow and ice on the fixed lines can vary quite a bit. 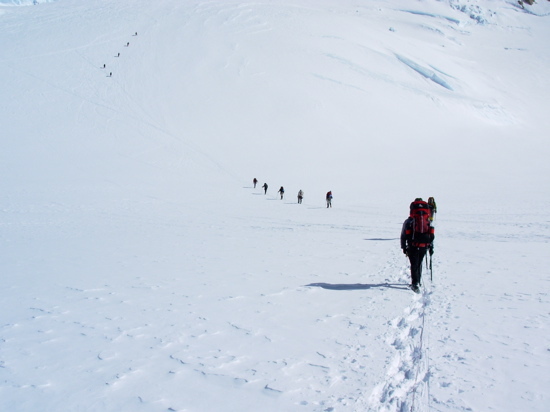 When there is snow on this portion of the route (usually through early May) the ascent can be very straightforward and not overly taxing. 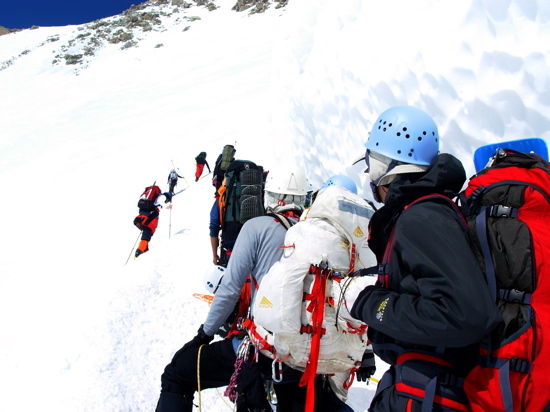 Later in the season the Headwall become very icy and is quite a bit more physically demanding. Typically the angle is about 50 degrees with steeper bulges in spots. 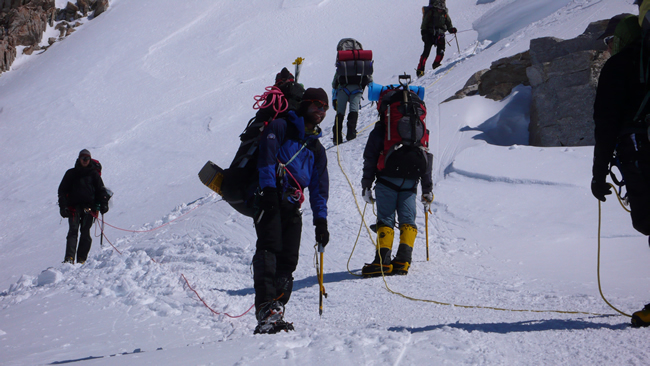 AAI teams head out from 14 Camp on the way to the base of the fixed lines. 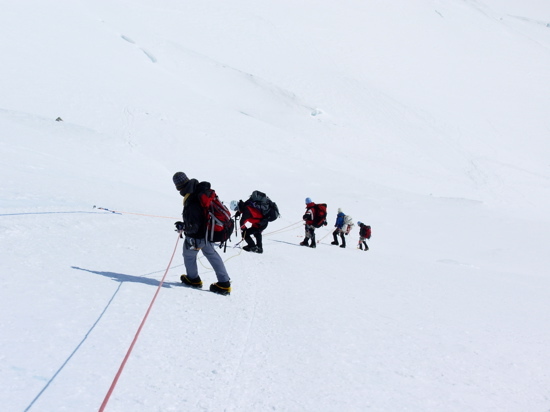 Rope teams approaching the base of the fixed lines. 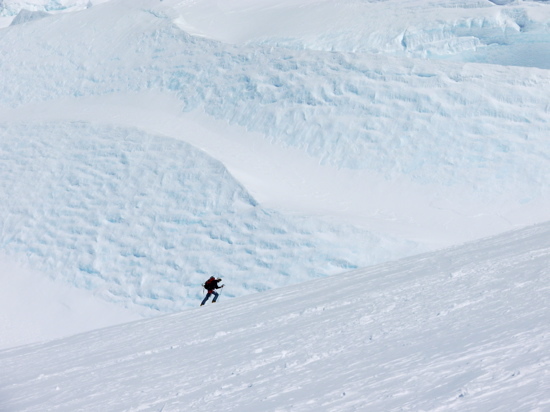 A lone skier traverse under and immense serac below the fixed lines. Many teams approach the base of the fixed lines. 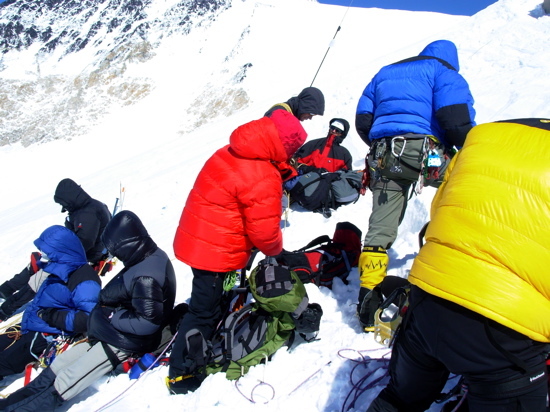 An AAI team prepares to gear up for the fixed lines. Traversing out to the lines. AAI Guide Erik Johnson leads out to the lines. 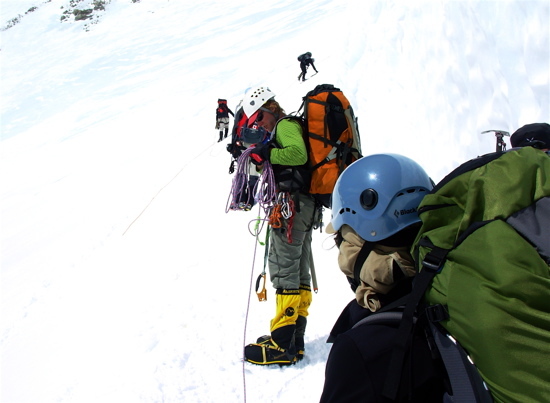 Climbers reach the fixed lines and clip in. Looking down on parties ascending the lines on the headwall. 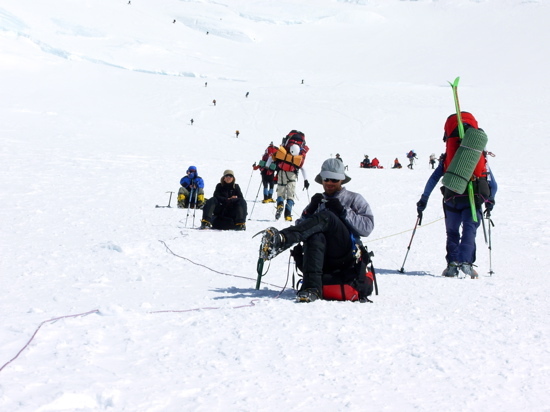 A group digging their cache at the top of the fixed lines around 16,300 feet. 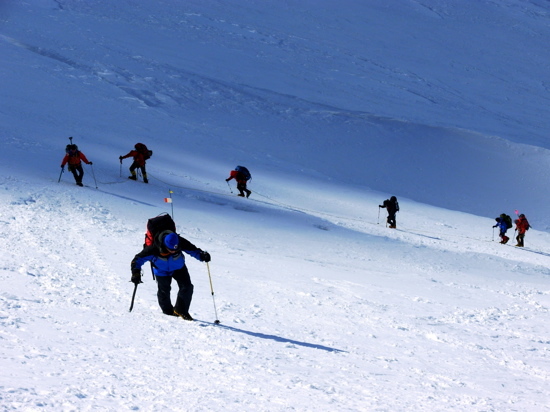 A group descends the fixed lines. 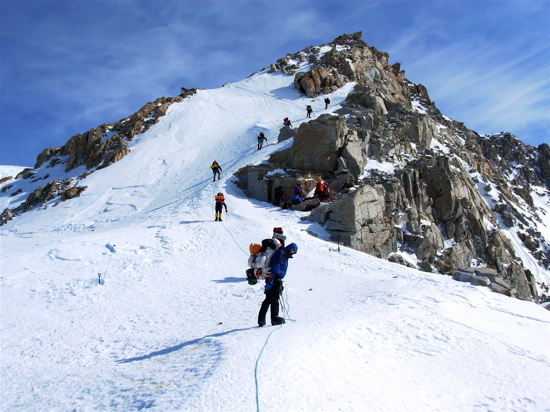 Climbers descending past a bergschrund on the fixed lines. 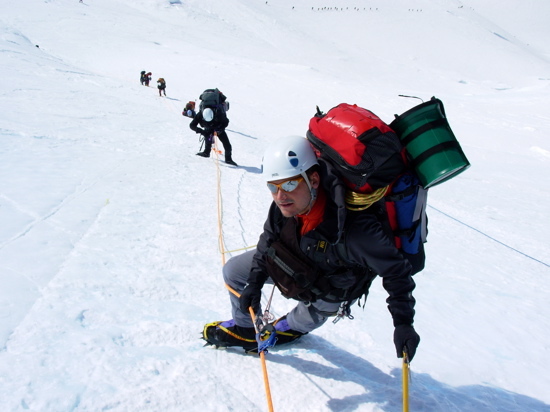 AAI Guide Matt Anderson leading a team to the lines in the early morning. 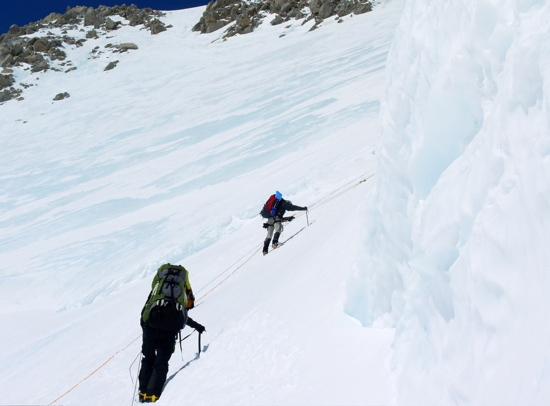 Climber Adam Janikowsky approach the lines with a team on the headwall high above. 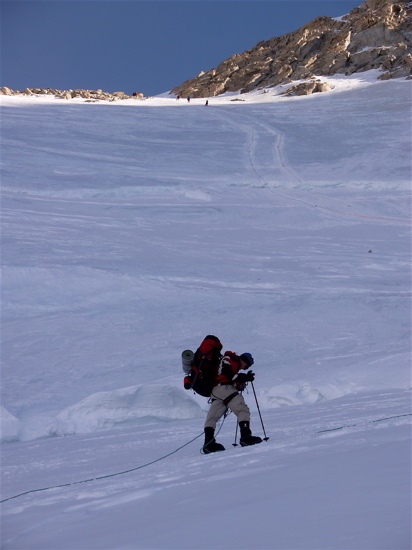 Scott Parazynski enroute to the fixed lines in the early morning. 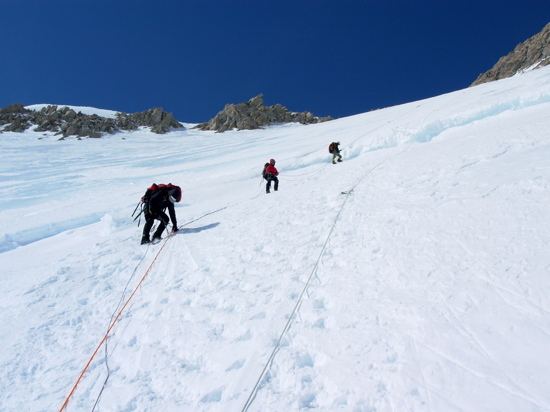 Rope teams working their way towards the base of the lines. 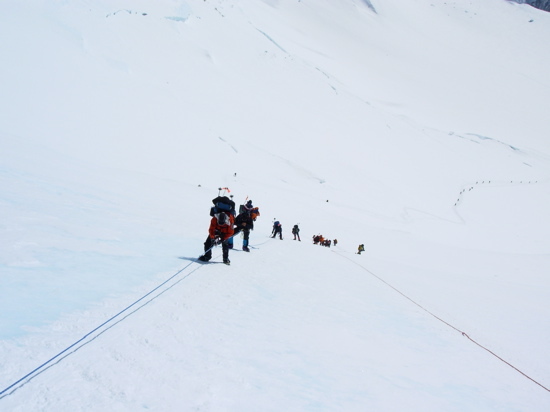 Rope teams on the lower fixed lines. Looking up the fixed lines. Matt Anderson leads a team up the fixed lines. 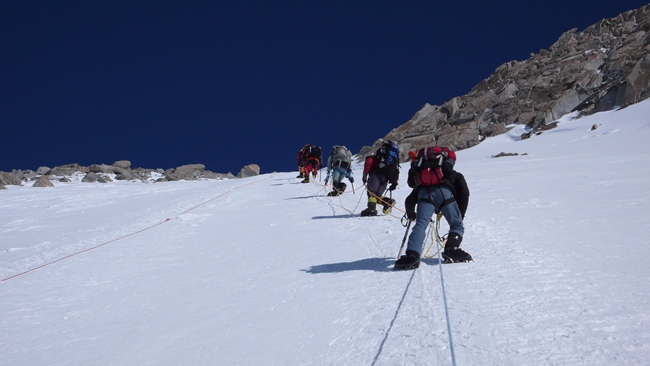 Nearing the top of the fixed lines. At the top of the fixed lines at 16,200 feet. 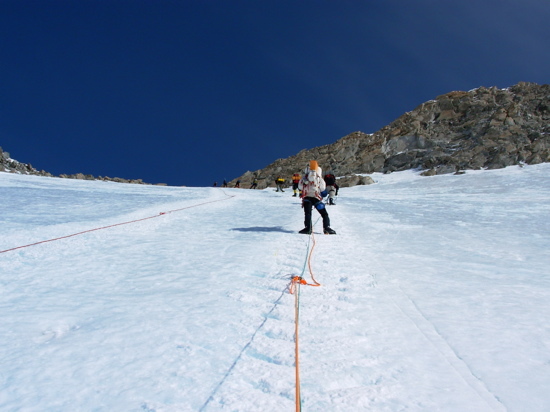 Looking across the top of the fixed lines and the crest of the Direct West Buttress. 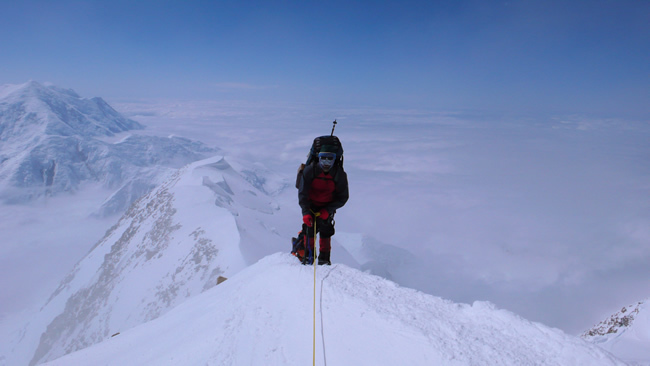 From the top of the fixed lines to High Camp is perhaps the most aesthetic part of the entire West Buttress route. 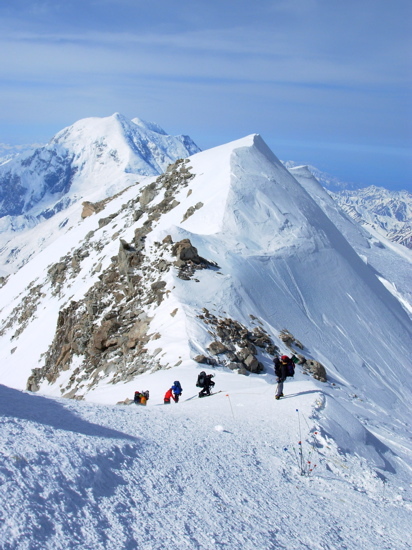 The climber's route follows the crest of a narrow ridge that offers breathtaking views down off both sides of the ridge. 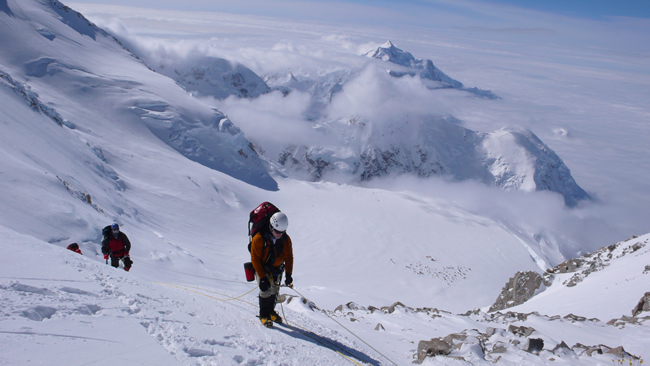 On the climber's left, the terrain drops away into the Upper Peters Glacier basin, and to the left we look back down at Camp 3 and beyond to the Kahiltna Glacier miles below and to the south. We gain about 1000 feet of elevation along the crest ridge, but it seems to pass fairly quickly as the scenery and exposure tends to keep one's attention occupied. 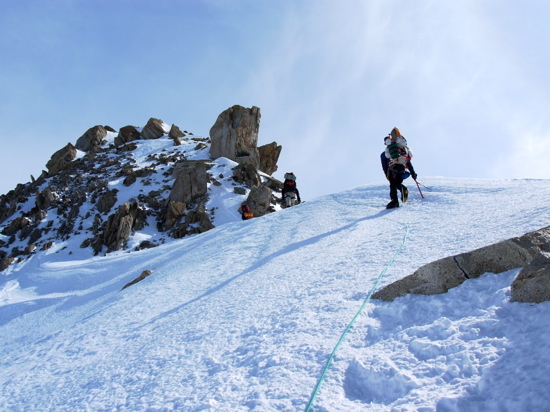 The climbing is mostly on snow, but depending on the time of year there can be some rock scrambling and icy sections along the crest of the ridge. 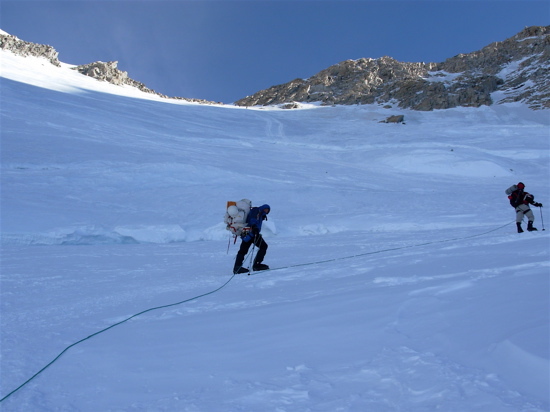 We use pickets and ice screws for running protection, and there are a few short sections of fixed line below a feature called "Washburn's Thumb." 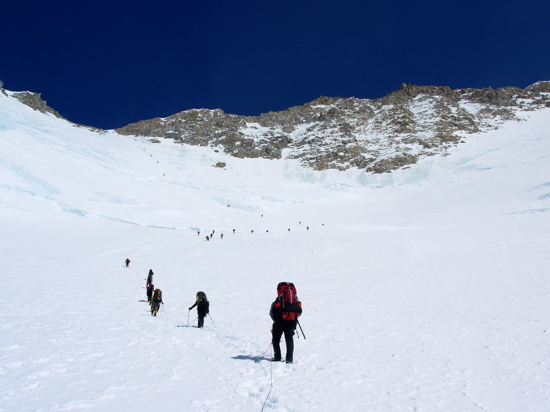 Just before reaching High Camp, the ridge broadens and flattens out as we reach our last camp at 17,200 feet. 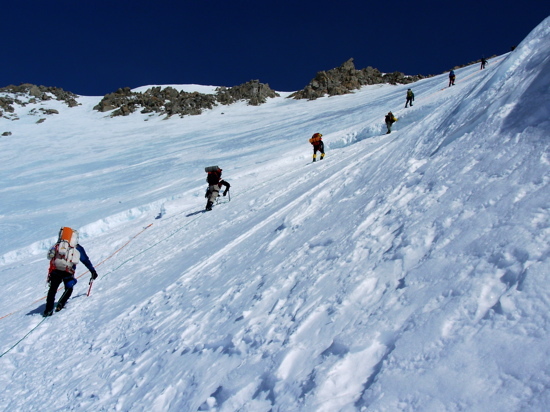 An AAI rope team just above the top of the fixed lines and headed up the ridge. 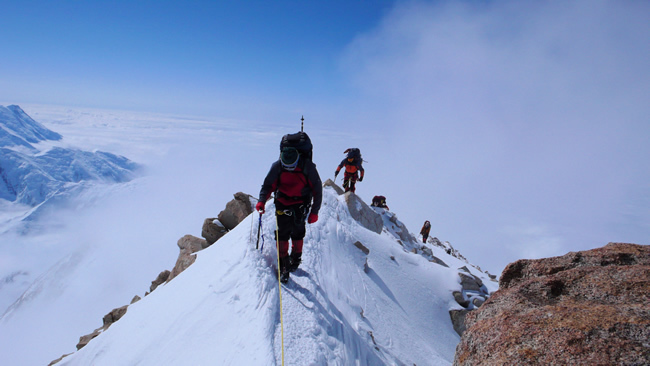 Climbers on the ridge at 16,500 feet approaching Washburn's Thumb. 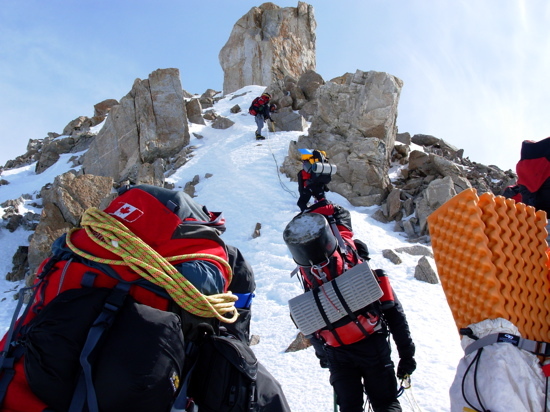 A party passes a group of resting climbers along the crest of the ridge. Approaching the fixed lines below Washburn's Thumb. 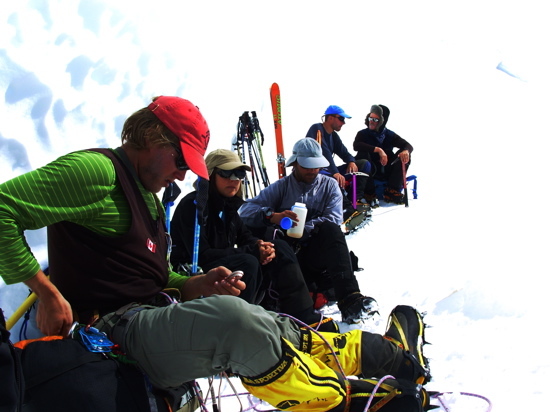 An AAI team starts up the fixed lines below Washburn's Thumb. AAI guide Joey Elton leads a team back towards the top of the fixed lines. 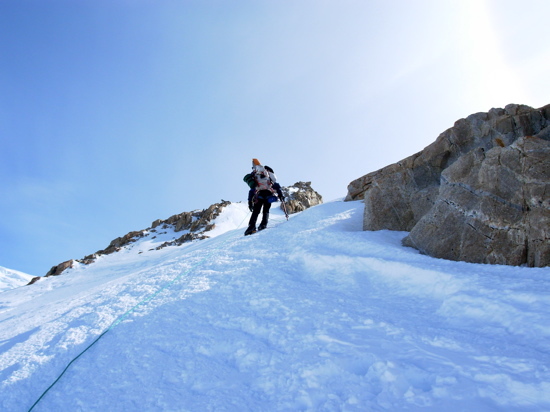 AAI climber Jamie Garis on the ridge above the fixed lines. 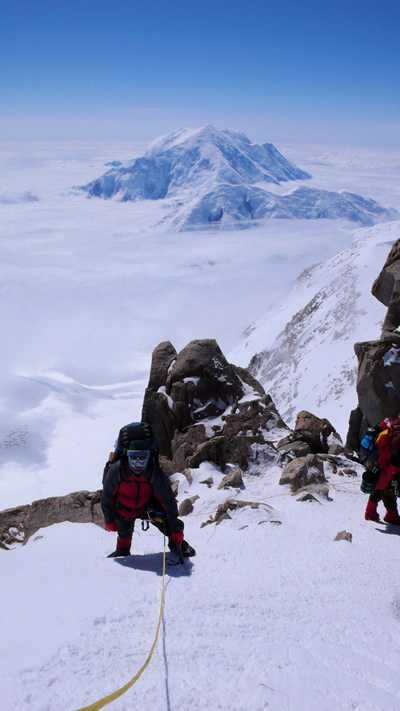 On the ridge at 16,500 feet. 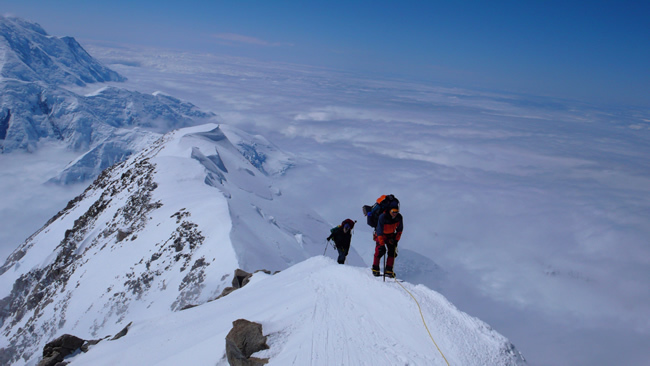 Looking down on Washburn's Thumb with Mount Foraker behind. 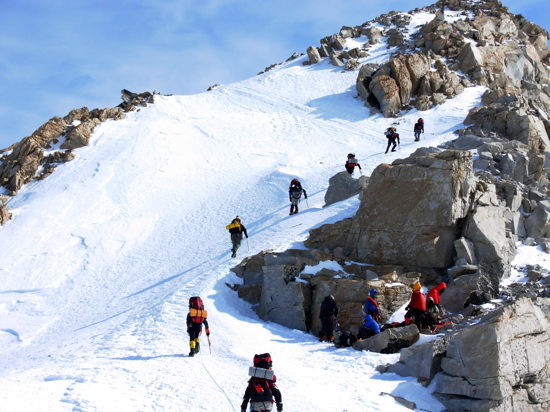 Nearing the end of the ridge below High Camp.